If you compulsively scroll news headlines, and enjoy browsing RSS feeds, but don’t particularly care for managing them, you might consider downloading iNewz for your iPhone or iPod touch. News at Your Fingertips: iNewz won’t win many points for visual appeal, but it does offer a wide variety of content. A newsreader that makes subscription management easy—just check or uncheck a box, as you wish—iNewz is a rich source of mainstream media with wide-ranging and diverse content. But iNewz suffers from a pedestrian look and poor offline reading support. iNewz from ourLivez is not a full-fledged RSS reader, like Newsstand ( ) or Byline ( . You can’t subscribe to your favorite blogs, or the new White House RSS feed as you can with Google Reader or other RSS reader apps, for example. Rather, iNewz functions as an aggregator with an RSS interface. With iNewz, you can follow up to 450 feeds from 65 domestic and foreign newspapers and media sources, including the New York Times, Chicago Tribune, Telegraph of London, Asia Times and Toronto Sun. iNewz breaks down the news like a traditional newspaper might: Headline news at the top, followed by foreign news, business, politics, technology, sports and so forth. All that’s missing is an opinion section. The app feeds stories from all of your subscriptions into each section, which can make for some interesting reading. It is fun to jump from CNN to the BBC to the L.A. Times or the Boston Globe with a few taps. Graphically, the app bears remarkable resemblance to H.L. 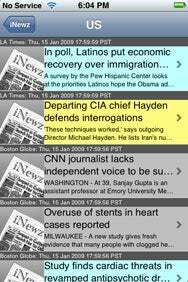 Mencken’s description of the editorial pages of his day: “(N)o more typographical charm than the death-notices and stock-market reports… as flat and deadly as the Congressional Record.” Actually, iNewz could be the shy, retiring younger brother of the AP Mobile News Network app ( . But with news apps as visually appealing as the New York Times ( ) or USA Today ( ) out there, iNewz simply looks tired and a bit monotonous. The real trouble with iNewz is with offline reading. The app boasts this feature, but it’s no different from any other RSS reader I’ve tried. The app will download feeds of your stories, but you can only read the summaries offline. And the summaries, of course, routinely consist only of the story’s lead paragraph—the usual. So iNewz is really only worthwhile when you have a working Wi-Fi, EDGE or 3G connection. When you want to read a full article, you simply tap on the headline and iNewz will launch an integrated browser. You are at the mercy of the Web site’s design, of course, but the app does support landscape viewing, which makes zoomed text much easier to read. You can bookmark any story—the app will highlight it in a dull yellow—but I was sorry to see there is no way to mark all stories as read. iNewz is hip to social networking, however. You can easily share stories via Twitter or del.icio.us with a touch of an icon at the bottom of the screen, but you need to enter your usernames and passwords. As a certified news junkie, I very much like iNewz’s rich list of sources. As a temperamentally lazy person, I like the ease and convenience of picking and choosing the publications I want to read. The international news sources are good—although I wouldn’t mind seeing English versions of Le Monde or Der Spiegel. And the Jerusalem Post would be a nice addition. Even then, I’m not sure I would throw out my other RSS readers for iNewz. iNewz is compatible with any iPhone or iPod Touch running the iPhone 2.x software update.